ITBP Notification is out. ITBP is recruiting for 496 Medical Officers Govt Job Posts. You can check ITBP - Indo-Tibetan Border Police last date, download ITBP notification, visit ITBP official website and check other ITBP Vacancy details.Complete Vacancy and recruitment Details about 496 Medical Officers Govt Job vacancies in ITBP are provided below by JobSarkari.Com only for you. Last Date of Apply Online. 01/05/2019. Last Date of Pay Fee. 01/05/2019. SC/ ST/ Ex Servicemen / Female. No Fee. For Super Specialist Medical Officer Posts. Neurology. 01. 00. 00. 00. 01. Nephrology. 01. 00. 00. 00. 01. Gastroenterology. 01. 00. 00. 00. 01. Neurosurgery. 00. 01. 00. 00. 01. Total Vacancy. 03. 01. 00. 00. 04. For Specialist Medical Officer Posts. BSF. 26. 16. 10. 04. 56. CRPF. 20. 38. 17. 10. 85. SSB. 19. 00. 00. 00. 19. ITBP. 02. 05. 01. 01. 09. Assam Rifles. 04. 01. 01. 00. 06. Total Vacancy. 71. 60. 29. 15. 175. BSF. 36. 54. 12. 00. 102. CRPF. 13. 03. 03. 02. 21. SSB. 14. 35. 08. 02. 59. ITBP. 18. 58. 29. 02. 107. Assam Rifles. 04. 17. 07. 00. 28. Total Vacancy 85. 167. 59. 06. 317. Grand Total. 159. 228. 88. 21. 496. Super Specialist Medical Officer. Candidate Must Have Passed MBBS or Equivalent And Must be Enrolled in Any State Medical Register Maintained Under the Act And Having Post Graduation Degree or Diploma in Related Field And Having DM or M.Ch. or Equivalent With 3 Years Experience in Related Field. Max 50 Years. Specialist Medical Officer. Candidate Having Medical Qualification of Allopathic System of Medicines And Must have Completed Compulsory Rotating Internship And Having Post Graduation Degree/ Diploma in Related Field With 1 Year 6 Months Experience in Related Field As Mentioned in Notification. Max 40 Years. Medical Officers. Candidate Having Medical Qualification of Allopathic System of Medicines And Must have Completed Compulsory Rotating Internship As Mentioned in Notification. Max 30 Years. Height. 157.5 Cms. 142 Cms. Weight. Proportionate to Height And Age. Proportionate to Height And Age. 2. Physical Standard Test/ Interview. 4. Candidate Need to Apply Online On Or Before 01st May 2019. Q. 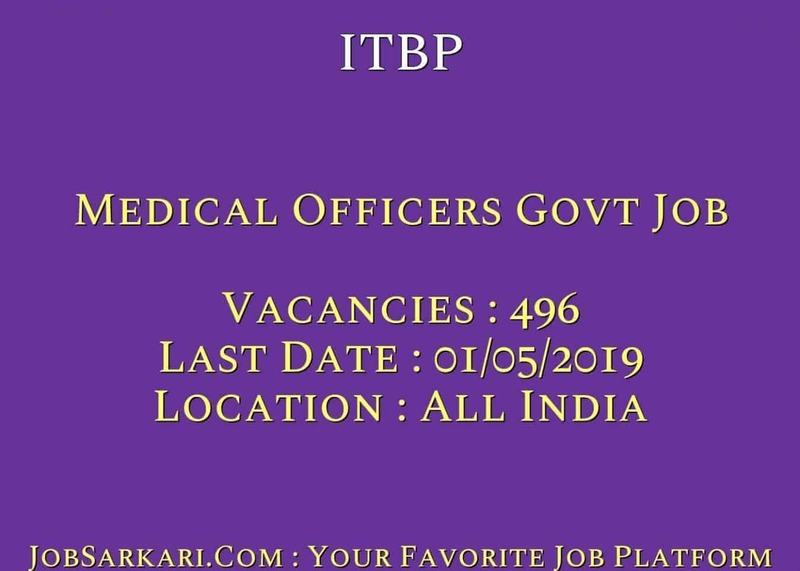 What is the Last Date For ITBP Medical Officers Govt Job Vacancy ? A. 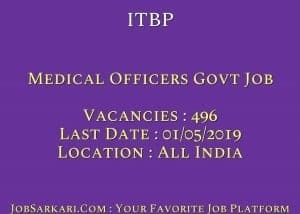 Last Date for ITBP Medical Officers Govt Job Posts is 01/05/2019. Q. What is the Form Type of ITBP Medical Officers Govt Job Recruitment ? A. The Form Type for ITBP Medical Officers Govt Job Posts is Online. Q. How many vacancies are available in Indo-Tibetan Border Police Medical Officers Govt Job Posts ? A. There are about 500 Vacancies in Indo-Tibetan Border Police Medical Officers Govt Job Posts. Q. What is the Full Form of ITBP ? A. Full Form of ITBP is Indo-Tibetan Border Police . Yes You Can Apply For This Post. pharmacy students are eligible for this post…..?